The Lion and the Rose tells the story of an infantry battalion in the Great War. 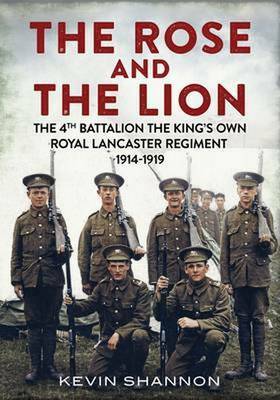 Based on many unpublished sources, the book narrates the individual parts played by nearly 2,000 of those who served with the 4th King's Own (Royal Lancaster) Regiment from the day that war was declared in 1914 until the armistice in 1918 and in a few cases, the stories of men whose war continued long afterwards. The battalion first saw action in Festubert in May 1915 and went on to fight on the Somme, the Ypres Salient and Gillemont Farm, though the battalion's epic stand at Givenchy on 9 April 1918 must rate as one of the greatest defensive actions of the war. Using contemporary combat reports, many of the major actions are described down to individual platoon level. The Lion and the Rose does not just concentrate on the major battles, but also examines everyday life in the trenches. Appendices give the most complete battalion roll to date and list those awarded medals for their bravery and also those nominated unsuccessfully for recognition.